TALLADEGA, Ala. (AP)—Jeff Burton’s emotions following his close call at Talladega Superspeedway had the ring of a bittersweet country song. “I’m heart broke but at the same time, I’m happy,” Burton said. He was overtaken by his drafting partner and teammate Clint Bowyer near the finish line of Sunday’s race, finishing second after contending for victory for the first time in a disappointing season. Burton wasn’t faulting Bowyer for disbanding their temporary partnership to take a shot at victory and said he didn’t play it too nicely or do anything differently because it was his teammate. Burton had plenty to celebrate considering the way his season had been going. He made it less than halfway through the Daytona 500 before engine troubles took him out, and then finished 26th at Phoenix. A strong run Sunday left him tantalizingly close to Victory Lane after leading 26 laps, and a little uncertain of how to feel. “I’m (ticked) off and I’m happy at the same time, if there’s such a thing,” said Burton, who had only one Top 10 finish in the first 31 races. “Any time you come here and you can get a Top 10, have a car that’s not torn up, you have to at least be somewhat happy with that. However, to come that close and to lose, is disheartening. It’s always worse to lose them close. BLANEY’S SHOWING: Dave Blaney did more than just run up front for a while at Talladega’s tri-oval this time. He drove his No. 36 Chevrolet to a third-place finish with Brad Keselowski both finishing and spending a chunk of the afternoon right behind him. Blaney, who signed with Tommy Baldwin Racing in January, hung with the bigger, better funded teams. “It’s huge for our race team,” he said. “It’s a tiny little team. It’s a big, big accomplishment. Blaney led 21 laps at Talladega’s spring race but finished 27th. “I was happy how we ran that day,” he said. “It just didn’t work out. We didn’t get the finish but we performed well and hung in there all day. BUSCH TUMBLES: Kyle Busch took a tumble in NASCAR’s Chase for the Sprint Cup championship. Busch was among those caught up in a wreck with 84 laps to go. He wound up 33rd in the race and slipped two spots to No. 6 in the points standing. More significantly, he went from 18 points behind Carl Edwards to 40 down a week after starting last and finishing second at Charlotte. “We were up towards the front and we got wrecked out,” said Dave Rogers, Busch’s crew chief. “It’s so hard to know where you need to be and this race is so circumstantial. The incident also involved Jamie McMurray, Marcos Ambrose, Kevin Harvick and AJ Allmendinger. 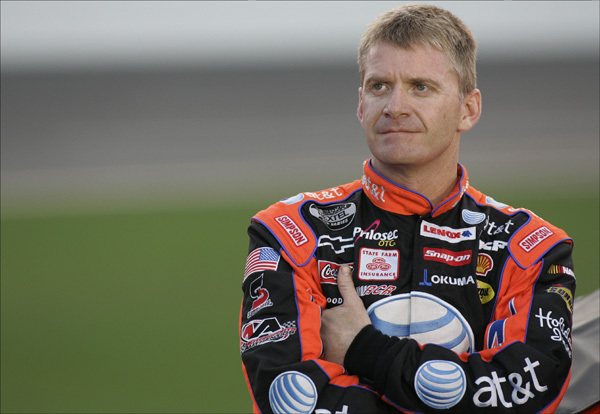 JTG PLANS: JTG Daugherty Racing said Sunday that Bobby Labonte will return to the No. 47 Toyota next season. The 2000 NASCAR champion will have Todd Berrier as crew chief. Berrier spent nearly two decades at Richard Childress Racing, leading Kevin Harvick to wins in the 2007 Daytona 500 and 2003 Brickyard 400. “I like the plan that this team has in place and if you look at the choices I’ve made throughout my career, you can tell that I have always enjoyed the challenge of building up a team,” Labonte said. Frank Kerr, who had been crew chief of the No. 47 for the last four seasons, will now be shop foreman. The team is moving back to its old race shop in Harrisburg, N.C., after spending the last few seasons working out of Michael Waltrip Racing as an affiliate of that organization. Labonte was 35th after a wreck knocked him out of the race on the 174th lap. He appeared wobbly as he walked to the ambulance but was evaluated and released from the infield care center. Steve Guiremand is the editor of Rebel Nation, a UNLV all-sports publication owned by Stephens Media that is printed weekly from August through April. He was born in southern California and graduated from the University of Southern California in 1978. He has covered college and professional sports as well as recruiting for over 30 years for several publications including the Los Angeles Herald-Examiner, The National Sports Daily, the Long Beach Press-Telegram and the Las Vegas Sun. He moved to Las Vegas in 1998 and has covered UNLV football and basketball as well as the old Las Vegas Stars triple-A baseball team. He’ll blog about UNLV sports and recruiting.